The structure indicated is the radial vein of the forearm. 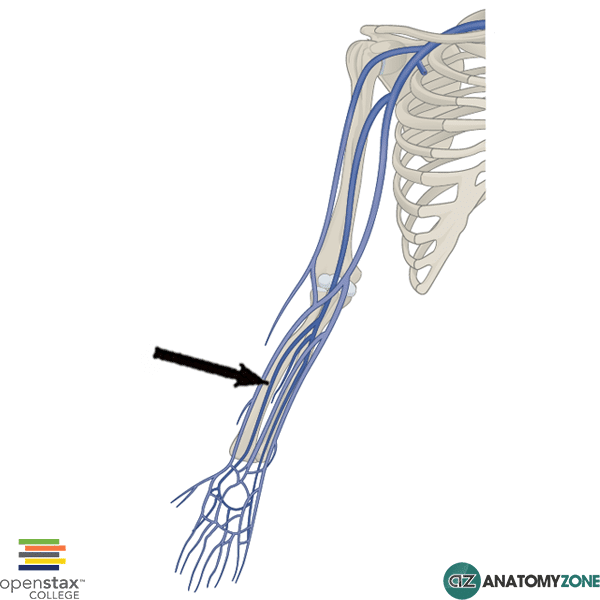 The venous drainage of the upper limb consists of a superficial system and a deep system. The superficial system drains to the deep system. The veins of the deep system accompany the arteries, and are known as venae comitantes which is the Latin for “accompanying veins” (vena comitans = singular). The veins which accompany the arteries are often in pairs, and are therefore frequently referred to in the plural form – venae comitantes. The radial veins are paired veins which accompany the radial artery in the forearm. The radial veins originate from the deep palmar venous arch and unite with the ulnar veins to drain into the paired brachial veins. Learn more about the anatomy of the veins of the body in this tutorial.